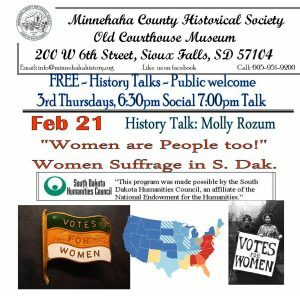 MCHS Third Thursday History Talk with Molly Rozum. The title, Women are People Too!, tells a lot about the subject and she will focus on Women Suffrage in South Dakota. A historical and timely topic for these days. always Free and Open to the Public.. join the MCHS to meet and greet and program at 7:00 pm on the second floor of the Old Courthouse Museum. You could come earlier and enjoy the museum’s many free exhibits before hand.